Company: Media Education CEE, s.r.o. 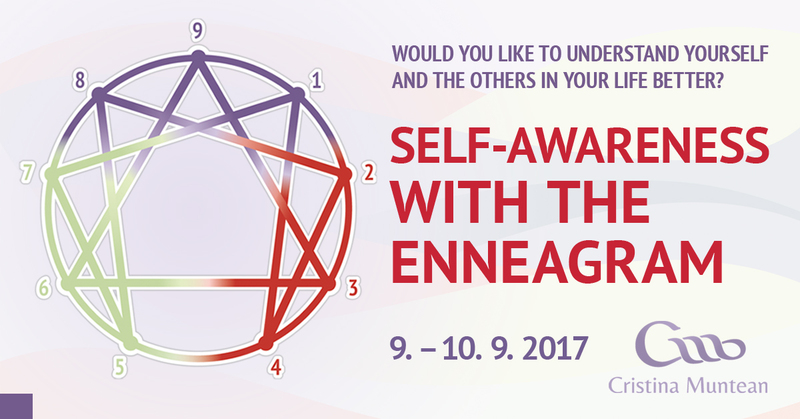 This course is the first in the Czech Republic introducing the basics of the Enneagram, a complex and dynamic system of personal development, to an English speaking audience. Would you like to understand yourself and the people in your life better? Would you like to know why people behave the way they do, even when their behavior often seems to you totally irrational or incomprehensible? Would you like to enjoy better, deeper relationships at work and at home? If so, join Cristina for this two-day intensive training on Self-awareness with the Enneagram. The Enneagram is one of the deepest, most complex and dynamic systems of personal development available today. It combines a richness of traditional, psychological and real-life wisdom that turn it into a genuine map of human behavior. Cristina is an internationally certified trainer with Enneagram Worldwide, one of the most prestigious Enneagram schools today. Her dream is to make this amazing tool available to as many people as possible. That’s why this course is an accomplishment: it is for the first time when the basics of the Enneagram are taught in English to people in the Czech Republic and CEE. Stress behavior and growth paths for each personality type. A set of recommendations for yourself on how to handle stress and how to allow the best of yourself to emerge regardless of the outer circumstances. Recruiters and headhunters who would like to gain a better understanding of their candidates during interviews etc. Price: 2500 CZK / 100 EUR, VAT not included. 10% discount for registered AmCham members.